Muscat, March 13, 2018: Oman Arab Bank (OAB), in line with its efforts to support community activities, recently sponsored the Azzan bin Qais International School (ABQIS) for their ‘International Day for Charity’ event. The event was held at the school premises in Boushar and saw the attendance of a large of number of people. The charity event consisted of several activities including competitions, performances, and face painting. There was also a souq setup at the venue. Also participating in the event were a large number of social media celebrities. 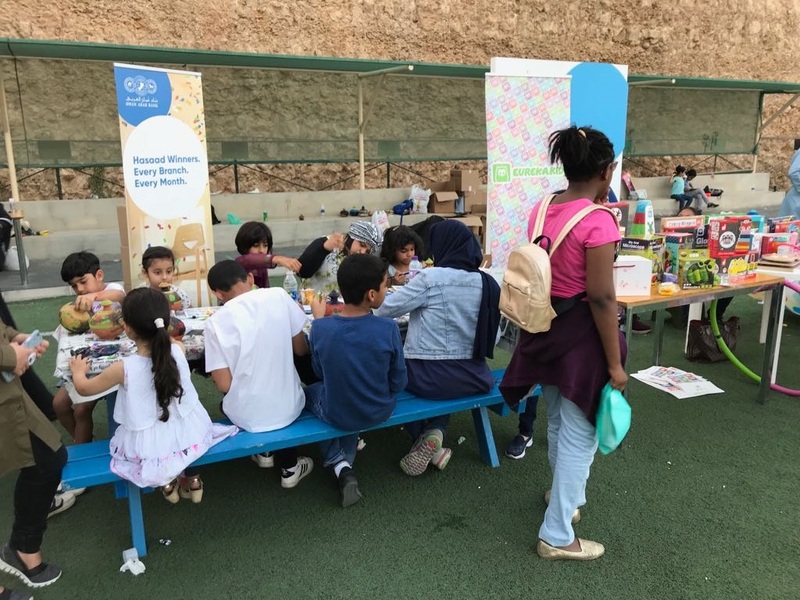 As part of its sponsorship, OAB set up a stall at the event grounds where it showcased its various products as services; particularly its children’s accounts and the accompanying child education savings plan. “Our child education savings plan was created with the aim of providing parents with an effective means to helps save for their children’s education and build a brighter future for them. It utilises a completely autonomous system for carrying out monthly debits from the parent’s account to the child’s account, thereby offering absolute simplicity and convenience,” added Hilal. As part of this Savings Plan, parents with accounts at OAB can now open an account for their children, following which a predefined amount will automatically be transferred from the parent to the child’s account at monthly intervals. The monthly savings amount can range from as low as OMR 25 to a maximum of OMR 5,000 and can be amended by the parent at any time without any additional charge. Under the plan the account will benefit from a high interest rate of 1.75% per annum on the monthly deposit balance. As a further value added benefit, the plan offers bonus interest, calculated at 1.25% per annum, once every three years. This bonus is applied above the existing interest rate and is automatically awarded following regular monthly deposits for 36 consecutive months. In addition to the high interest rate and bonus interest awarded every three years, the plan offer several other benefits. For starters, the account is entitled to take part in the Hassad Savings scheme with a chance to win cash prizes every month as part of the special draws for children. The plan also comes with free life insurance which covers up to OMR 50,000 in case of any unforeseen incident that may occur to the parent. This allows parents to rest assured of the continuity of monthly payments to the account. Oman Arab Bank is one of the first banks to be established in Oman, with a rich and proud history. Today, the bank operates a nationwide network of 65 branches and representative offices and 148 ATMs spread across the Sultanate. OAB provides the complete range of financial products and services for personal banking, corporate and investment clients.